We all know and love a delicious korma, or for the stronger of stomach, a fiery hot vindaloo, but Indian food in the UK is quite different from the fare that you can expect to be served up in India itself. The diversity of dishes may come as a surprise, but India is a vast nation and regional food vary a lot due to what is grown and what is able to grow and survive locally. Astonishingly, India has about 8,000 years’ worth of culinary history. In that time local ingredients and spices have mixed with those of invaders and trade partners, particularly the Middle East, the UK and Portugal, each introducing a different ingredient or taste and creating some of the world’s most tongue-tingling and exotic dishes. The secular nature of India also means that there are many religious rules to follow, so it is in fact a brilliant country to visit as a vegetarian, otherwise the most common meats used are chicken and mutton. A delicious unleavened flatbread, most prevalent in northern India, paratha are prepared in a similar style to puff pastry, with lots of ghee layers and folding. Cooked on a ‘tava’ a flat frying pan, and finished by shallow frying, paratha can be served plain or stuffed. Common stuffings include spiced potato, dal (lentils), or paneer, whilst a plain paratha can be eaten with pickles, chutneys or any saucy curry dish. It is also often eaten for breakfast, with just a dollop of butter on top. There are many, many different styles of paratha, each region having a different style…all the more to taste then! A traditional southern Indian breakfast morsel, the Idli is a fluffy, savoury cake, made from a batter of fermented black lentil and rice, and steamed. A version of this cake has existed for centuries, as mentions of it appear in ancient Indian texts. Idli is often served with sambar, a lentil-based vegetable stew that is made with tamarind and plenty of spices and oils, another dish that originates in the south of the country. A popular street food, Chole Bhature is a Punjabi dish that combines a chickpea curry with a deep-fried leavened bread called bhatoora. The chickpea curry is dry and spicy, featuring spices such as ginger, dried mango powder, crushed pomegranate seeds and garam masala – in some areas it is served quite dry, whilst in others it will come with a sauce. The bhatoora is a delicious fluffy bread, perfect for dipping. A frozen dairy dessert Kulfi, the ‘Indian ice cream’ is an extremely popular pudding across India. Denser and creamier than the ice-cream that we know and love, because it is not whipped, there are many, many flavours available, but the most traditional are cream, rose, mango, cardamom, saffron and pistachio. ‘Kulfi’ is from the Persian word meaning ‘covered cup’ so it is likely that this desserts origins are in the Mughal Empire. The ultimate in Indian dishes, thali features six dishes along with staple foods such as rice and roti. Thali is actually the name of the plate that the food is set on. 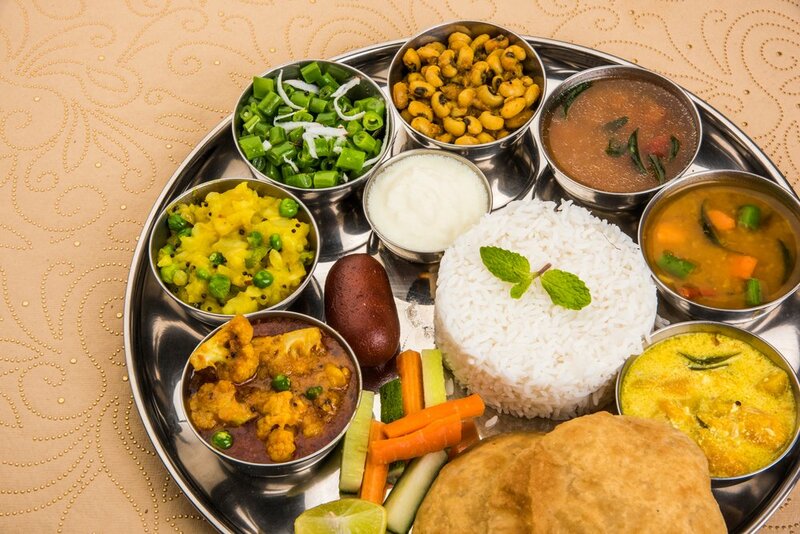 Indians believe that a proper meal should feature the perfect balance of six flavours – sweet, salty, sour, bitter, astringent and spicy, so with a thali, you get a dish for each. The dishes which you actually get on your thali will depend on whereabouts you are in India, but you can expect to choose between a vegetable version and a meat version. If you fancy a trip to India just give an Asia Inspirations team a call – whether you want a specialist food tour, or just want to explore the sights while enjoying local cuisine, we can sort you out.